The Grade of Casting GG-20, T-slotted, Size 22H12. 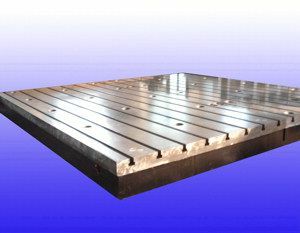 Specification of our Cast iron Floor plate. 4000 mm x 1250 mm x 300 mm (13' x 4' x 11.8") 4800 Kg (Immediate delivery- Subject to prior sale. These Plates have Loading Capacity 15 Ton/Sqm, the "T" slot size is 32 H12 (Suitable for M27 Bolt). Material is GG 20).